All of our eBook projects include the Kindle and ePub formats by default. Our Kindle/Mobipocket file is not just a converted ePub file; it is built using its own Kindle-specific source code, ensuring that the features and formatting that are not possible in an automated ePub conversion are properly included. Our ePub file is a generic file that will work on all of the major reading systems, but we can also create an additional iBooks-specific ePub if the client wants to take advantage of specific design or functionality enhancements that are only possible in iBooks. We also offer conversions into the eReader and LIT formats, but I do not usually suggest that clients pursue those formats because they are steadily being replaced with ePub. In addition to standard ePub files, we offer a variety of enhancement options, some of which will only work in iBooks and some of which will work in any reading system. These enhancements include embedded video and audio, fixed-layout ePubs for iBooks (children’s books, etc. ), embedded PDFs, enhanced non-linear tables, and additional internal and external linking. The full list of enhancements can be found on our website: http://ebookarchitects.com/conversions/services.php. We typically accept PDF and MS Word files, but we can also start with XML, HTML and other sources. We also accept print books. 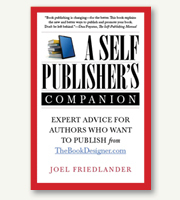 Many authors and publishers have backlist titles with no digital files. We scan and OCR the text in these books, and we can make editorial additions or updates to the book as necessary. In addition to the Kindle and ePub files, clients can also request a Word document that can be used for future print editions or for archival purposes. It is usually best to start with a PDF because it is a standardized format that most customers have the ability to create, and because it reliably conveys to us the print book design, which we try to include in our eBook design as much as possible. Also, a PDF-based process allows us to retain page number placement and other data that is lost in an InDesign to ePub conversion. InDesign is not usually a good source from which to start because of the variation in style use and design quality that depend entirely on who created the InDesign file. Our current queue is about 10 weeks long, but we are working hard to get that turnaround time reduced. Clients are encouraged to get their projects penciled into the queue as much as six months in advance to ensure timely delivery. We can sometimes squeeze in projects on a 2-week turnaround, but that option is usually reserved for repeat customers with an unexpected rush job, and it depends on availability. Our eBook design services are priced in two main categories: novels and non-fiction. Novels are priced at a flat fee of $150 (under 400 pages), $200 (400-800 pages), or $250 (more than 800 pages). Non-fiction titles are priced between $1.50 and $2.00 per page depending on the complexity of the book, and most books fit into the standard fee of $1.75 per page. Additional services like enhancements are charged on an individual basis. For more information on our pricing, please see our website: http://ebookarchitects.com/conversions/services.php. Because of our ability to handle any kind of eBook layout or design, many of our clients utilize our services primarily for their most complex titles; however, we do create the best eBook files on the market, even for simple eBook layouts. While a large part of our client base is authors with individual titles, we do offer discounts for high-volume customers. Once a customer sends us 5 books, they receive a 5% discount, 10 books/10%, and 50+ books/15%. These are lifetime numbers, so there is no need to meet the minimum with one order; once achieved, discounts are applied to any books in the queue at that time and to all future projects.